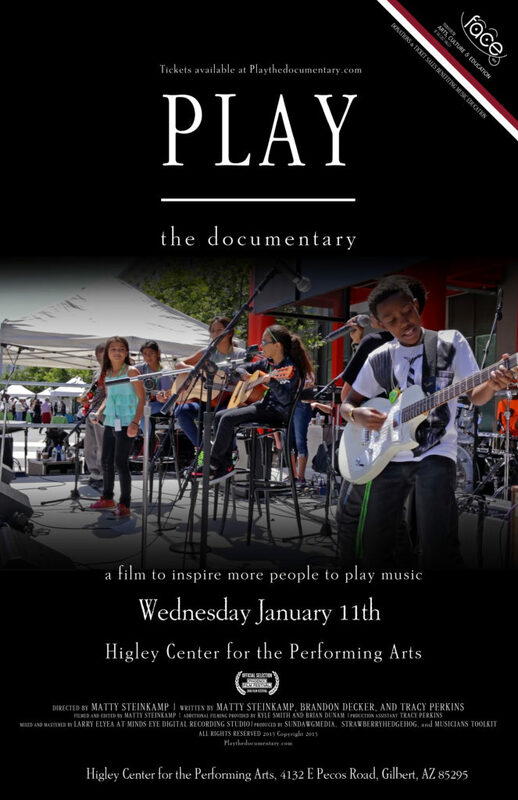 Official Screening with the Building Bridges Foundation and FACE January 11th at the Higley Center for the Performing Arts. We are very excited to announce our biggest theater and screening yet. January 11th at the Higley Center. Tickets are on sale today!! This event is co-presented by the Foundation for Arts, Culture and Education of the East Valley and the Higley Center for the Performing Arts. It is our goal to fill this theater and raise over $10,000 for music education in one night of amazing music and fun. This is so much more than just a movie screening event, check out all the things included in your ticket. Higley Center for Performing Arts has close to 1200 seats for us to fill. Join in the movement to keep music in schools. All proceeds for this event will benefit Building Bridges Foundation and their music education programs. All profits from this charitable event go to the Foundation for Arts, Culture and Education of the East Valley. Building Bridges is the Foundation’s signature music program. It is incredibly successful and moving into its 8th year in 2017. Building Bridges has brought music and social education to nearly 18,500 school children from 40 different elementary schools right here in the East Valley. Loved by teachers, parents and children alike, this K-6 annual event features the dynamic music of three-time Grammy Award winner, Tom Chapin. This year, for the first time, FACE is expanding Building Bridges to include an adapted program and a special sensory friendly LIVE concert featuring Tom Chapin for children with special needs, specifically children on the Autism Spectrum. By buying a ticket to this Movie Event you are supporting the Foundation’s vision to present programming such as Building Bridges FREE OF CHARGE to local children and participating schools. THANK YOU!